Key-perspectives: two great sciences; complementing cultures; complementing methodologies; towards a creative synthesis; evolutionary significance. The words “Management” and “Yoga” have become well known in contemporary literature. However the essential spirit and significance of these two great sciences or disciplines is not fully understood. There are many definitions on the meaning of management but if we ask a management student what is the essential process of management not many would be able to answer the question precisely with clarity. And there is much more misunderstanding on the meaning of yoga. But, if we can pierce through all these misconception and examine with a discerning look at the deeper spirit of management and yoga, we will find they are complementary sciences and therefore can be synthesized. If we can arrive at such a synthesis in concept and practice, it can become a great force for the higher evolution of the corporate world and humanity as a whole. This article examines the complementing links between management and yoga and the possibility of a synthesis. The path of yoga and the science of management represent respectively the pragmatic core of the spiritual genius of the East and the secular dynamism of the West. The essential cultural imperative behind the evolution of Management is the central belief or vision of the modern western culture in the progressive perfectibility of the outer economic, social and political life of the human race through the application of a secular science and technology and a philosophy of secular humanism. The essential cultural imperative behind Yoga is the faith or belief of the ancient eastern spiritual culture in the freedom and perfection of the inner being of humans through the application of a spiritual and psychological science and technology and a philosophy of a spiritual humanism. In our modern age, management has become a practical melting-pot and synthesis of modern secular sciences like information sciences, social science and psychological science. Similarly, yoga in ancient India was a practical melting pot and synthesis of the ancient spiritual sciences like religion, philosophy, ethics and psychology or to be more precise applied spiritual psychology. When we move from the cultural to the strategic sphere or methodologies there also we find striking complementary links between management and yoga. There is much misunderstanding on the true nature of yoga. The popular conceptions equate yoga either with bodily postures of hathayoga or world-denying meditations in remote forests, ashrams or mountain peaks. What is not recognized is that yoga is a form of applied psychology for accelerating the inner evolution of human beings. And when this inner growth expresses itself in the outer life, it can lead to a better quality of the corporate life, with an ultimate impact on the bottom-line. In this sense, management and yoga are complementing sciences. There are many correspondences between yoga and management. What management does to our outer life, yoga can do to our inner being. The main principle of yoga is a concentrated application of the energies and resources of the inner being of humans to achieve an inner moral or spiritual goal. Similarly the main principle of management is a concentrated application of the energies and resources of the outer life of humans to realize an economic, commercial or social goal. In both cases there is an accelerated evolution of the inner being or the outer life of humans. The following statements from two accomplisher practitioners of yoga and management will illustrate this point. Sri Aurobindo, a great yogi of modern India, writing on the significance of yoga states, “yoga may be regarded as a means of compressing one’s evolution into a single life or a few years or even a few months” which means yoga accelerates the speed and process of human evolution. In the domain of management, Anurag Behar, a senior manager at Wipro, commenting on the results of constantly renewed management initiatives, in his company, states, “It’s an accelerated life-cycle. We do a shift in five to seven years that most societies go through in 50 years.” Here again it is accelerated evolution. Let us examine briefly how this process of accelerated evolution works in management and yoga. The key to this understanding lies in the Indian yogic term: Tapas. This Sanskrit word is normally translated as “austerity.” But in a deeper perspective, Tapas means, as Sri Aurobindo puts it, “energisation of consciousness.” And in a broader view, Tapas may be defined as the inner or outer discipline which leads to a focused energisation of the resources and energies of consciousness or life. The essential nature of Tapas in management and yoga are the same, but in different domains; it is three fold: concentration, integration and mastery. First is the focus or concentration of the resources and energies on the aim to be realized; second is the coordination, harmonization and integration of the energies and resources of the various dimensions of life or consciousness; third is the harmonious control and mastery over these energies. In management, the form of Tapas is the concentration, integration and mastery of the material, economic, social, political and cultural energies of the outer life of a community or organization for the realization of an external aim. In yoga, the nature of Tapas is the concentration, integration and mastery of the physical, sensational, emotional, vital, intellectual, volitional, ethical, aesthetic and spiritual energies of the inner being of humans for the realization of an inner aim. But the most important and interesting point to note here is that the outer life of humans which is the sphere of management is nothing but an expression of the needs and faculties of its inner being which is the domain of yoga. The socio-economic life of a collectivity is predominantly the expression of the needs of the physical, vital and emotional being of humans for enjoyment, production, acquisition, relationship and interchange. Similarly, the political life of man is the outer expression of the needs of the volitional being in him for power, control and mastery. And the cultural life of humans is the expression of the needs of its intellectual, ethical, aesthetic and spiritual being for knowledge values, ideals, and the quest for the ultimate aims of life. Thus we can see that the tapas of management are the complementing expression in outer life of the Tapas of the inner being in yoga. And the results of tapas in management and yoga are also similar and complementary. The tapas of management tends towards minimizing waste and maximising the efficiency and productivity of the resource and energies of the outer life; it also tends to accelerate the progress of the outer life, or in other words, the material, economic, social and political evolution of the community. The tapas of yoga tends to minimize the wastage and maximize the creative potentialities of the physical, vital, emotional, intellectual, ethical and spiritual energies of the inner being of humans and as a result accelerate the psychological and spiritual evolution of the individual. There is one more important factor in management which has no correspondence in yoga, but can be a crucial factor in forging a synthesis between yoga and management; it is the capacity for execution. As Peter Drucker once said, management is not the sole property of business, but an organ of the human society; it is the executive force of human society. Management is that power or faculty of the pragmatic mind of humanity for an efficient and productive materialization of an idea in the outer life. However in our modern age, the cream of this executive force of humanity, exists in business. The complementing links between yoga and management points out to the possibility of a creative synthesis between two great sciences of the ancient and modern world. The key to this synthesis lies in two factors: first, a human resource development paradigm based on the principles of yoga; second is an organizational environment or structure which felicitates the creative self-expression of the inner growth attained through yoga in every activity of the corporate life. The path of yoga will lead to the moral, psychological and spiritual development of the individual; it will bring about a progressive elevation of the motive, ideals, values, thought feelings and actions of the individual from the physical, sensuous and the average emotional or mental being to a higher intuitive, moral, aesthetic an spiritual levels. When this inner growth expresses itself in the outer life it will have a corresponding impact on the quality of the corporate life, with its eventual results in the bottomline. But for effectuating this collective impact, there must be an organizational environment, culture, structure and policies which provide sufficient opportunities and encouragement interms of education, training and motivation for this higher evolution and its self-expression in every activity of the corporate life. For example, the practice of yoga may lead to the awakening of the ethical or aesthetic or intuitive faculties in the individual. Those magnificently beautiful painting in Ajanta and Ellora caves are done not by professional artists but by Buddhist yogis. When this happens in an individual employee as the result of yoga, she must be given sufficient encouragement and opportunities to express these higher faculties in her work-life. She must be encouraged to think how to make the corporate life more beautiful, ethical or intuitive. This is the vision or concept which can be the basis of a new paradigm in management which may be called as Integral Management. As we have said earlier, the central core of management and the core competence of business is the ability to materialize an idea in the outer life. If the idea is sufficiently elevating and transforming then the corporate world, with its executive competence, can be a power for transformation of the human society. 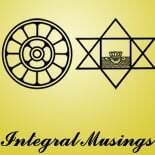 The paradigm of Integral Management can be such a transforming Idea. This meeting or synthesis of management and yoga has a great evolutionary significance for humanity as a whole. We humans, as a species, are an unfinished project. We have not yet realized all our potentialities hidden within us, especially in the moral, psychological and spiritual realms of our consciousness. We have to progress or evolve further to reach our highest potential as human being. The work and life of the modern corporate world provides a rich field of experience not only for professional growth but also for evolution of the individual. For someone who is seeking for moral and spiritual development, the corporate world provides a more effective field of experience for accelerated inner growth than an isolated ashram, monastery or forest. The problems, difficulties, challenges, temptation and conflicts of the corporate world are a fertile arena for becoming fully conscious of our weaknesses and strengths and also for expressing our inner potentialities. Secondly, the modern corporate experiences provide the right anvil for testing the quality and genuineness of our inner growth.